The Kalispell Community Garden (KCG) allows locals, who don’t otherwise have the means, a location to grow their own vegetables to provide nutritious foods for their families. The Kalispell Community Garden has 50 gardening plots free to the community members. As it resides near low-income housing, many rely on their plots for a fresh source of produce. However, there are also many community members that donate some or all of their produce to the food bank. 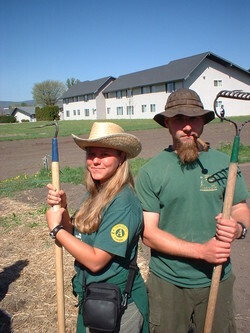 The combined support of the Montana Conservation Corps, the city of Kalispell, and local youth groups keep this garden flourishing. The diversity of the community volunteers along with the location of the garden also help the garden be success. The Kalispell Community Garden (KCG) is facilitated at Liberty and Hawthorn streets in Kalispell, Montana. To view the setup of the gardens, click for a site map. Gardeners are usually folks who don’t have the space or means to garden at home, and many live on limited incomes. The KCG has been in existence since the early 2000’s and will hopefully remain in existence for years to come. Key factors to making it a success are the partnerships involved with the city, nonprofit organizations, the Food Bank and local volunteers. Specific partner organizations include the City of Kalispell, Nourish the Flathead, and the Center for Restorative Youth Justice. Individual gardeners’ personal investment in the quality of produce and the appearance of the garden space also plays a vital role in the success of the gardens. Involved participants span from families with small children, retired seniors, local youth programs, local high school students, and various volunteers. The story is a long one, but great credit goes to the City of Kalispell for providing the space, the water, and plenty of other resources to bring the garden to fruition. From there, partnerships with nonprofits like the Montana Conservation Corps and the Food Bank filled in gaps for maintenance. Gardeners donate all excess produce to the Food Bank. Great gratitude and recognition goes to the volunteer garden coordinators who have taken on the role of being point people for the gardeners, coordinating work days, managing maintenance needs, and being excellent watchdogs for garden activities. Additional resources include information about Composting and Kalispell’s Garden Rules. Posted in Flathead, Healthy Eating, Programs.